What a week it has been. Getting back in the groove at work, and dealing with a 17 year old who came down with a severe outbreak of hives. I’m talking head to toe hives. This started Monday evening. Tuesday I tried to get him into the doctor, but they were booked. Ended up in the ER with him Tuesday night, only to find out I was already doing pretty much everything that could be done. They did give him some stronger antihistamine and a shot of steroid. Today has been the best one since, they were pretty much nonexistant til about 6:00 and a few popped back up. It’s a weird thing. I mean he was completely covered in them. I tried to get him to let me take a pic of his back for my blog, but that got an emphatic “no!” LOL. We have no idea at all what caused them. Very frustrating and unsettling. Many thanks to Jan for giving me advice and moral support! Hives is scary – I’m glad it worked out! I’ve been dealing with a mystery allergy for aobut 2 weeks. I think I’ve tracked it to black cohosh which is a bummer because it was really helping the hot flashes! The pumpkin quilting is adorable! Even though I only worked Monday and today I am so glad its Friday too. Hopefully the flu bug has left my premises and the Hives bug has left yours! I’m glad the hives seem to have subsided. 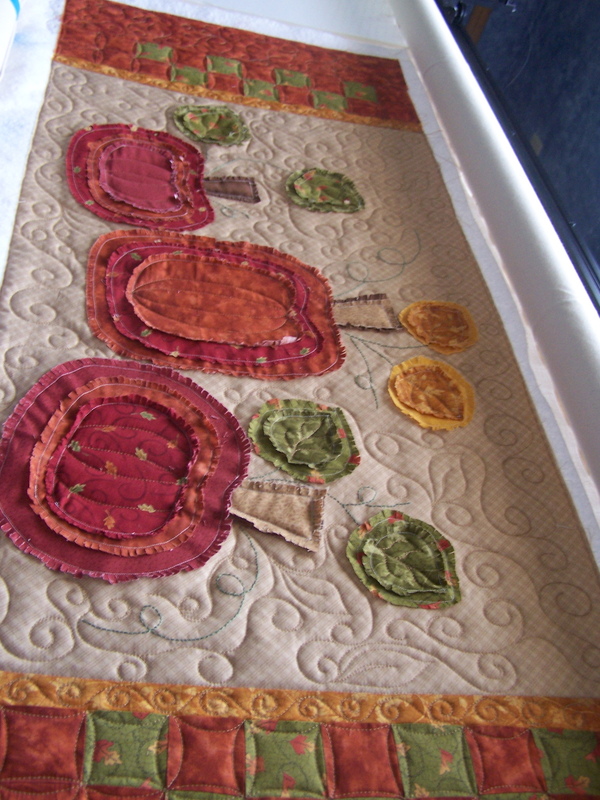 Cool Runner, she’ll be ready for fall, I love your quilting Randi it looks great! Hope you get the allergy stuff identified and sorted out with your son. It’s hard when you don’t know what causes them. Love the pumpkins Randi. Sorry about your sons hive attack. They really are scary Our youngest son has had allergy attacks that close his throat. He carries a epipen at all times. Sending hugs! Glad they are subsiding!!! And glad you found some time for quilt therapy!! ‘Fess up, sweet Randi! You received an Intelliquilter for Chrhistmas, right? Now I know why you’re quilting is so perfectly done…. Really cute pumpkins and I can see how the edges will fluff up when it’s washed…what a great idea! The punkins are luvverly!! You always have wonderful quilting design ideas and execute them to a T! Hope the hives are all gone now and really hope you can figure out what caused them. A couple of years ago, Will had an unexplained rash, all over his poor little body. We took him to the doctor, and they thought it was probably a reaction to a virus — and that it might take up to a month before the rash went completely away. Thankfully, it was only a day or so. My sister-in-law has been dealing with something similar for months now, and again, her doctors say it’s a virus, not allergies. Steroids helped, but as soon as she went off the steroids it came back. I hope your son is feeling better today. And I LOVE that pumpkin runner. 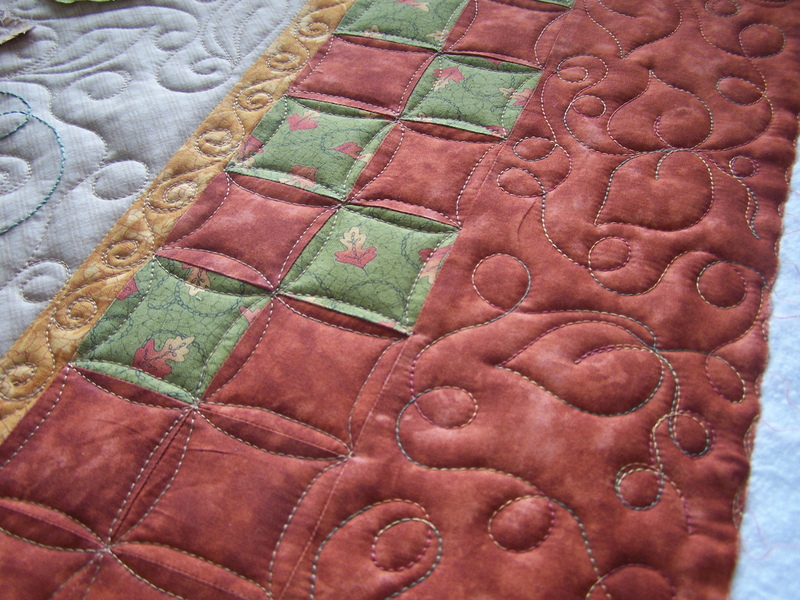 The exposed edges add a nice touch, and as always, your quilting is perfection. Randi, I hope your son is much better by now. 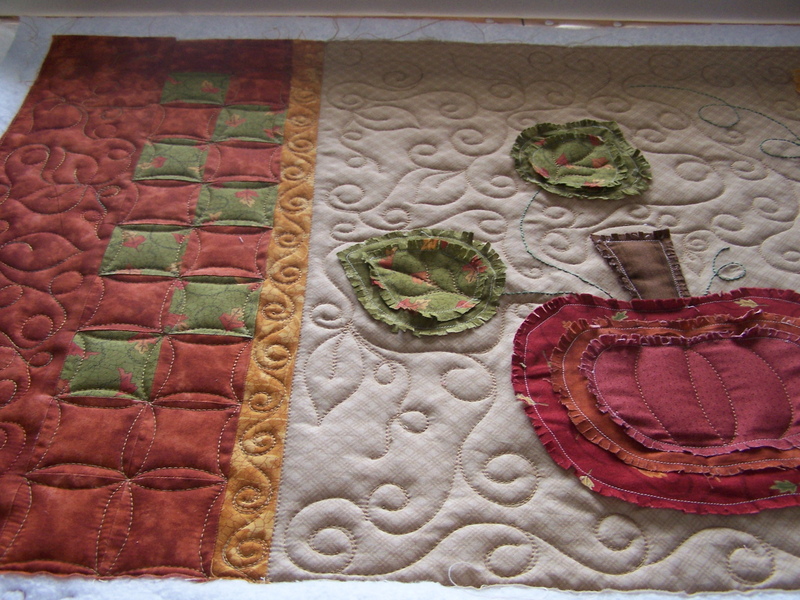 The pumpkin runner is fun and your quilting looks great. What a cute runner. Love it! I just found your blog for the first time, following your signature link from MQR. Love your work! Really cute pumpkins and I love the quilting on them. Glad your son is feeling better. Cute runner~ your quilting really brings it to life! Hope your DS is feeling better! Wow! This is strange…my son broke out into a massive case of hives last week as well! Couldn’t get him into the doctor either so after the third day it was off to the hospital. We have no idea what caused this and the hospital was little help only suggesting Benadryl pills and cream. It’s now been a week and the hives are still there, luckily not as red, but still there. I have to take him back, it is so frustrating not knowing what is going on. I hope your son is on the mend and that you have found some answers!